Boneless Skinless Chicken Breast is the tender white meat cut from the chest of the bird, with the tenderloin removed. These breasts come skin-on with the rib bone attached. The bone helps distribute heat evenly throughout the breast and the skin keeps the breast moist and juicy. Bake them with salt and pepper, and the oil of your choice (maybe avocado if you want to get fancy)! Check out some of our great recipes for seasoning inspiration! Remember to season according to taste. 1. Preheat grill. If using open flame, wait for flames to die down. Right before grilling, make sure grill surface is extremely hot, then rub it down with an oil-soaked rag – we advise using tongs to hold the rolled-up rag. 2. Place Chicken Breast skin-side down at 45° angle across hottest part of grill grates, then grill for 8 min, while rotating 90° every 4 min. Keep your chicken moving to ensure that it cooks evenly. 3. Move chicken to cooler part of the grill, and flip over to skin-side up. Grill for 15 min while rotating 90° every 3-4 min. Remove from grill when meat thermometer inserted into thickest part of thigh reads 165°F. 3. Rest for at least 3 min. *Cooking times will vary depending on type of grill, heat source (BTU), and size and shape of meat. 2. Add oil. Once oil is hot, sear Split Chicken Breast skin-side down for 4 min, or until golden-brown and crisp. Flip and sear for 2 min. Remove and set aside. 3. Deglaze Dutch oven with braising liquid. 4. Place chicken back into Dutch oven. Add any remaining ingredients. Cover chicken halfway with braising liquid. 5. Bring to a low simmer, and cover with lid. 6. Finish the chicken on the stove top at the same low simmer, or in a 300°F preheated oven. Cook for 40 min, or until meat thermometer inserted into thickest part (without touching bone) reads 165°F. 7. Rest in juices for at least 8 min. 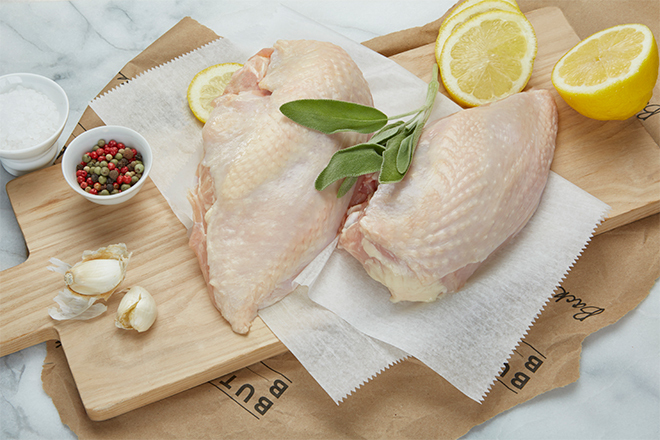 For crispy skin, preheat oven to 400°F, remove chicken from liquid and roast on sheet pan skin-side up for 5-10 min. *If you don’t have a Dutch oven, use a deep, heavy pot. Make sure it’s oven-safe if you transfer it to the oven later in Step 6. 2. Place Split Chicken Breast skin-side up on sheet pan. Roast in oven for 35 min, or until meat thermometer inserted into thickest part of the thigh reads 165°F. Remove from oven. 4. Rest for at least 3 min. DEFROST your meat properly – overnight in the fridge or under cold, running water for 30 min. Dry your meat completely and bring to ROOM TEMP before cooking. Before braising or slow-cooking, SEAR your meat for incredible depth of flavor. REST your meat. Slicing and serving it too soon means losing those delicious juices. If covering meat with foil to keep warm, cover it loosely so it doesn’t lose moisture. ButcherBox delivers 100% grass-fed beef, free range organic chicken and heritage breed pork directly to your door. Think of us as the neighborhood butcher for modern America.